Arias, who claims she killed Alexander in self defense, had approached prosecutors two years ago offering to plea to a second degree murder charge, which could carry a 25 year term, but the state rejected the offer, Nancy Grace reported on Good Morning America today. Prosecutors also showed receipts from Arias' trip from her California home to Alexander's home in Mesa, showing that she purchased a 10 gallons of gas at one gas station the night before she drove to Arizona, and then another 10 gallons from a different gas station 10 minutes later. Prosecutors are expected to argue she brought the gas with her to fill up her car secretly on the way to Alexander's home, showing premeditation for the murder. Arias' attorneys called Brewer as one of their first witnesses as they began mounting their case that Arias killed Alexander in self defense, arguing that Alexander was controlling and abusive toward Arias. They asked Brewer to explain how he and Arias had been in a stable relationship for four years, from 2002 to 2006, and had bought a home together before Arias met Alexander at a business conference and began to change. "I saw a lot of changes in Jodi. She became a different person than I had known previously," Brewer said, describing how Arias' behavior changed in May 2006 when she joined a company called Pre-Paid Legal. There, she met Alexander and began seeing him. She continued to live with Brewer. "She had continued to pay the mortgage, but she was not paying other household bills, she began getting into debt or financial trouble," Brewer said. "For me it seemed she was not as rational or logical." Brewer said that after Arias began to change, he made arrangements to move closer to his son from his first marriage, and he and Arias broke up. They kept in touch with occasional phone calls until Arias asked to borrow the gas cans in June 2008, and then called him a week after borrowing the cans to say that her friend had been killed. Martinez, reading notes from an interview Brewer gave to authorities during the investigation into Alexander's death, asked if Arias had ever mentioned needing an "alibi." Brewer said he did not recall any conversation about alibis. 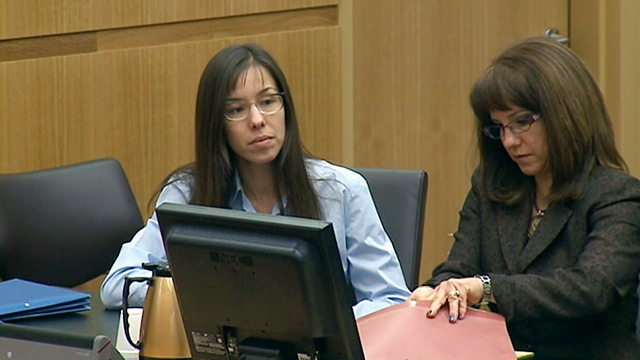 "After this date of June 4, 2008," Martinez asked, "you received a call from Jodi Arias, and she was very agitated?" "She was sad," Brewer said. "Did she tell you that her friend had been killed and she did not have an alibi?" "I don't remember that," Brewer said. Arias was arrested a month after Alexander was found dead, in July 2008.